In a former publishing house, east of Amsterdam’s city centre, the tip-tap of a table tennis game snaps back and forth through the air. There are comfy sofas, a retro photo booth, a shiny black foosball table and a curtained-off area with a TV that is never switched off. A launderette with a six-foot-high pin board for lost socks is located around the corner, and a bike shed is housed in the basement. It sounds like any other student union, but it’s not. In the high-ceilinged, too-cool-for-school reception, with its exposed industrial piping and trendy neon signage, two tourists are checking in, and seated at tables by the window, entrepreneurs jab away at their laptops. A giant sign with the words ‘everybody should like everybody’ hangs above them. Students, professionals and holidaymakers all share this space and rent rooms at the Student Hotel, and they all seem to get along fine. Thirteen floors above this is the nerve centre of the operation, a cool receptionist leans on a varnished, concrete bar, ordering pastries on the phone. Around her, a staggering panorama of Amsterdam: a plane heading for Schiphol, a factory belching out smoke, tower blocks and builders scuttling across on rooftops. To her right, another mantra: ‘only dead fish go with the flow.’ The Student Hotel is swimming with a different tide, and is fast establishing a new global trend. 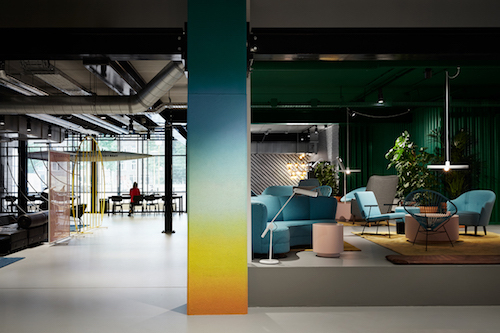 Founded by Scottish entrepreneur Charlie MacGregor, the hotel opened its first branch in 2011, and is one of Europe’s fastest-growing co-living, co-working concepts, with plans to extend its portfolio of 10 hotels to 41 by 2021. First established in the Netherlands, but now with branches across Europe, it saw a gap in the market where a shortage of student housing and an increase in international applicants was not being addressed. Bringing together three communities – workers, students and tourists – the hotel offers compact, well-appointed bedrooms and a huge, cleverly-zoned co-living space. Designed to integrate these communities, the stylish, modern-meets-retro design of the hotel is spot on. The overall atmosphere is collaborative, cool and fun. Nothing about the build says ‘student’ in the traditional, grungy sense that non-millennials are all too familiar with. Far from it! Bedrooms are air-conditioned and equipped with flat screen TVs; beds are double, rather than cramped singles; and there’s no queue for the shower as all rooms have private bathrooms. Smart shared kitchens, with dining tables and chairs, create a micro-sized meeting point, while the complimentary VanMoof bikes enables residents to explore the city outside. Seventy percent of the hotel’s student population are non-Dutch. With twice as many international students in the Netherlands as ten years ago and more than half of all university courses now taught in English, the demand for housing from this sector has increased. The hotel also solves the problem of finding accommodation when family want to visit. Parents can stay in the guests’ wing of the hotel, eat in the restaurant and work in the study areas. “Studying is the best excuse for friends and family to travel,” says Uffen, whose international guests have no shortage of visitors. The concept also works well for students attending open days, who are dependent on the advice and financial support of their families. “Parents are very important decision-makers,” says Uffen, who recognises the importance of catering to their needs too. The hotel is popular with corporate clients such as TomTom, Netflix and HuaWei, who find the funky office spaces, conference rooms and auditorium, as well as the stylish accommodation, a great way to house international employees new to the city or arrange away-days for company briefings. 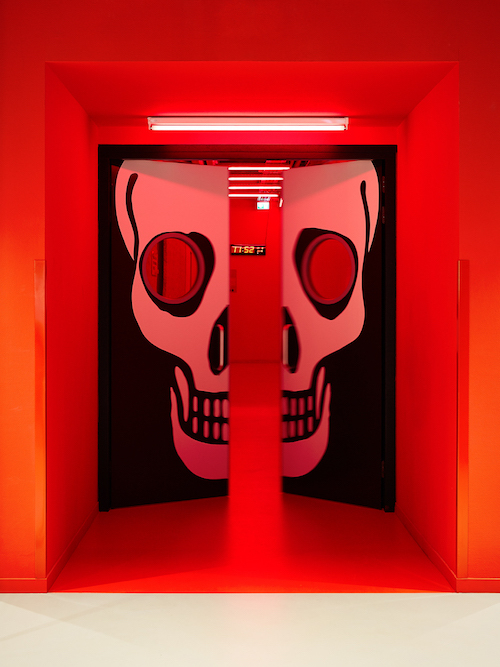 In Amsterdam, to the rear of the lobby, double doors emblazoned with a giant skull swing open onto a corridor lit in red. A left turn and guests arrive at the lifts; the gateway to the accommodation. Corporate customers and hotel guests are housed in a separate wing to the students, and all residents have elevator swipe cards for added security. The lobby, work spaces and gym are there to bring groups together, but there is peace and quiet when you need it too. Adjusting to a new country can also be a challenge. For this reason, the hotel also employs community managers who are responsible for the pastoral care of the hotel’s residents, particularly its student body. There is a full calendar of events and spacious communal areas to coax residents out of their rooms and create a social atmosphere. From student to entrepreneur, to business owner or high-flying employee – the hotel caters for your needs, follows your progress, and welcomes you as part of its global community. “We have students who live with us and it would be nice if they stayed with us forever,” says Eline van Hedel, Sales Coordinator at the Amsterdam Centrum branch. It is hoped that visitors who have finished their studies will return to soak up the student vibe, despite having moved onto a different stage of their life. Everywhere you go in the hotel you are met with mottos: ‘spread the love’ next to the complimentary condoms [Eline: “We are always looking for the edge”], ‘soap me up’ on the free soap in the bathroom, and ‘kick off your shoes’ pinned to the wall opposite the bed. But ‘may the student in you never die’ is the closest to the hotel’s heart, and you feel that youthful energy distinctly.